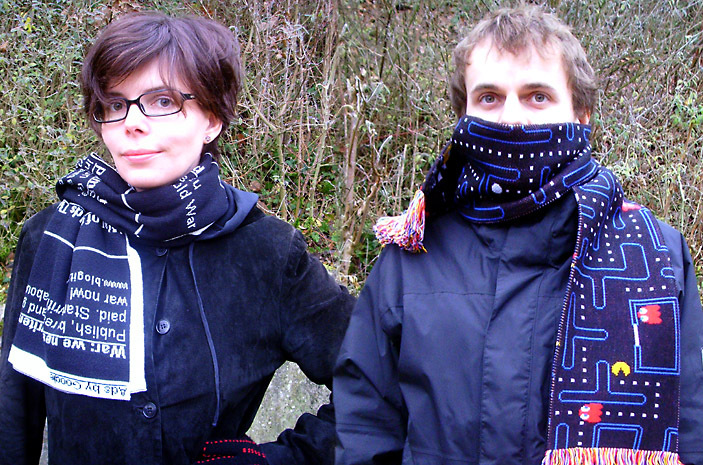 Olia's scarf shows Google Ads from her net art classic My boyfriend came back from the war. Dragan's scarf shows a scene from Pac Man. Attention: Our partner Vertexlist Gallery in Brooklyn offers these scarfs in an edition of 5. Please contact Marcin Ramocki for Details. Wo gibz denn den Pacman-Schal? Selbstgestrickt? This is the best thing i have ever seen in my entire life. Be mine! You know they just pay for clicks. We clicked on the scarfs but nothing happened. A net.artist drives in her Bentley... Nice scarfs!